Kate Andersen Brower, who received praise for The Residence: Inside the Private World of the White House last year, has returned with another insider’s look at life inside 1600 Pennsylvania Avenue. 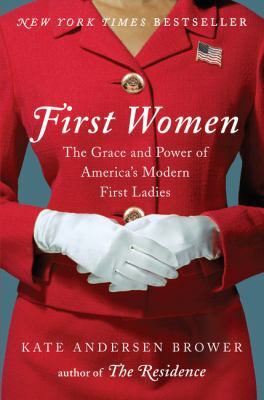 In First Women, she describes the experiences and personalities of the last half-century’s first ladies, beginning with Jacqueline Kennedy. Rather than focusing on these women individually, she instead arranges her book topically, comparing the first ladies’ respective experiences as supportive wives, as mothers, as FLOTUS, and as public actors in their own rights. Although Brower’s research is detailed and accurate, her writing had a gossipy element that I honestly really enjoyed. It was especially fun to learn about the first ladies’ relationships with each other. Deep friendships and intense rivalries have sprouted between the various first ladies, often in surprising ways. These nine women have had wildly differing temperaments and approaches to their roles, and it was delightful to learn about each of them. I will warn that I was initially put off by the audiobook narrator (it felt a little like Siri was reading to me), but I was soon so caught up in the stories that I didn't notice.